I like to think I make smart decisions when it comes to feeding my children. As a result, I have a 3-year-old who asks for broccoli and will gladly eat a bowl of fruit as a mid-day snack. That’s not to say he doesn’t also enjoy chocolate cupcakes and cookies, but who doesn’t??!! I believe all foods in moderation are just fine – but there needs to be a healthy, balanced base at the bottom of it all. That foundation starts early – and foods from NuturMe are a great way to introduce healthy foods to babies and toddlers. 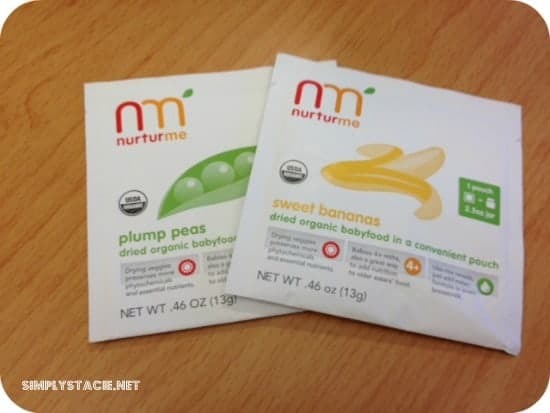 In the retail market since June 2010, NuturMe is the first and only certified-organic, all-natural, gluten-free baby food made from nutrient-rich, quick-dried fruits and vegetables. Their philosophy centers around achieving optimal health for infants combined with convenience for parents. Their food choices take your little ones from their first tastes through their toddler years. The quick-dried flavor packets mix easily with breast milk, whole milk, formula and water. As your child grows, you can still reap the healthy benefits of the NuturMe line by sprinkling the food over mac and cheese, yogurts and other purees. The packets have a 24 month shelf life, and the packets are slim and weigh less than an ounce (much easier to stash and carry along!). Through August 2012, NuturMe has committed to donating one 18-serving variety pack to the charity Feed The Children for every one purchased by a consumer. So you can feel good about what you’re feeding your child and also feel good knowing that you are giving back to the community. My youngest, at 10 months, is developing his tastes now, and I’m happy to feed him foods from NuturMe – I feel good knowing that he’s eating well, and that I’m helping him build a healthy foundation for his future. He enjoyed the Plump Peas and Banana samples we were sent (I mixed them together to give him the best of both worlds!). And on a selfish note, I’m happy to put a few packets in the diaper bag and not have to worry about adding any additional weight or bulk! You can find out more about NuturMe on their website, on Facebook, and on Twitter. While you’re on their site, be sure to check out their recipes for kids, and their blog. You can also find a retail locator on their site as well as a form to request your local retailers to carry the NuturMe line.